The ENC16/18 is a weather-resistant enclosure that is 16 inches wide and 18 inches tall. It can house a datalogger, a power supply, and at least one peripheral. This enclosure is recommended for applications that need to have multiple communication or measurement and control peripherals housed in the same enclosure. The ENC16/18's backplate is prepunched with one-inch-on-center holes suitable for attaching a datalogger, power supply, and a communications or measurement and control peripheral. This enclosure is shipped with the 7363 enclosure supply kit that consists of desiccant, a humidity indicator card, cable ties, wire tie tabs, putty, grommets, screws, and PVC coupling. 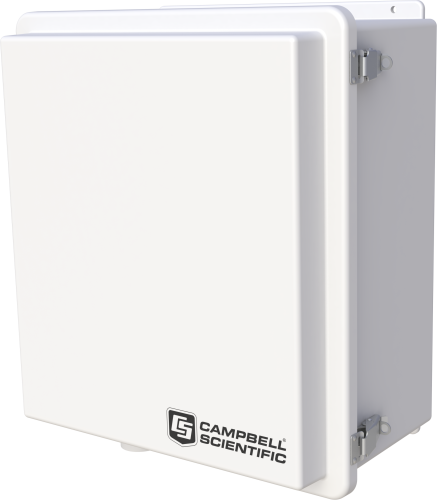 Additionally, Campbell Scientific offers a CS210 Enclosure Humidity Sensor for monitoring relative humidity inside of the enclosure (see Ordering Info). The -VC cable opening option is required to fit a BP84 84-Ahr power supply in the ENC16/18 (see Ordering Info). Can an ENC16/18 be used with an enclosure heater to increase the inside temperature and reduce the risk of condensation? Yes. However, we do not sell the heaters. What are the weight and internal dimensions of the ENC16/18? The ENC16/18 weighs 17 lb. Its internal dimensions are 16 x 18 x 9 in. Can 120 Vac be brought into the ENC16/18? Yes. Use a standard electrical box and outlet. Can converters to 18 Vac and 12 Vdc be located within an ENC16/18 without affecting the data logger or data? Most likely, yes. The data logger is protected against electrical noise, and 60 Hz filtering can be selected in many sensor measurements to filter out the effects of 60 Hz noise. Is a fiberglass enclosure suitable for an installation in a very cold location monitoring corrosion? Our fiberglass enclosures can withstand very cold locations, and their fiberglass/plastic construction is very resistant to corrosion. If the copper ground terminals attached to the bottom of an enclosure are oxidized and corroded, how can they be replaced? The terminals do not need to be replaced. Just sand or file the corrosion away, exposing clean copper, and the fittings will continue to be functional. If the PVC fittings at the bottom of the enclosure have too small an inner diameter to accommodate all the cables passing through, is there a way to remove the PVC fittings? Unscrew the PVC fittings to remove them. How many mounting accessories should be ordered for each major device inside an enclosure? It depends on the device. Most devices have built-in mounting flanges, but some items require a separate mounting bracket. How can a loose gasket on an enclosure be fixed? The following information is applicable to many of Campbell Scientific’s standard enclosures and prewired enclosures. Note: The procedure below will not work for torn or damaged seals. Pull the gasket away from the gasket channel, being careful not to tear the gasket. The gasket does not need to be removed completely. Rather, remove only those areas that have pulled loose on their own. To keep the gasket up out of the way, lay a small object (such as a toothpick, pen, or pencil) horizontally across the channel. Using an adhesive that is rated for use with polyurethane foam, apply a small bead of adhesive to the gasket channel. Because the adhesive’s only function is to keep the gasket in place, use it sparingly. Remove any objects that were holding the gasket out of the way. Carefully place the gasket in the gasket channel. Wait 1 to 3 hours for the adhesive to cure before closing the door.